How do we find those early America ancestors — the ones who lived in the early days of the 19th century? They’re often among the hardest to nail down. They’re not among the first arrivals, whose lives are often so well documented by those anxious to join lineage societies. And they’re not among those who lived long enough to be recorded in the wide variety of records we often have for our 20th century relatives. So how do we do what we need to do to locate these folks and add them to our family trees? How do we do it easily, using clues we can find online? And how do we do it accurately, in a way that meets the best practices of our field of genealogy? 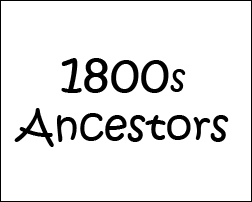 Come find out Tuesday, April 19th, when James M. Baker, PhD, CG, presents “Finding Your Early 1800s US Ancestors Online” in a free webinar presented by the Board for Certification of Genealogists starting at 8 p.m. Eastern time (7 p.m. CDT, 6 p.m. MDT, 5 p.m. PDT). • First, you need to register in advance for this webinar. The link to do that is here. • Second, as always with a live webinar, space is limited and registration does not guarantee a space. You may need to log in early to be sure to get a seat online for the live webinar. • Third, just so you don’t miss it, a recording will be available afterwards if you don’t manage to get in for the live presentation. If you’re able to join BCG for this webinar on April 19th, you’ll get to hear Jim Baker describe strategies to find early 1800s United States data. A case study illustrates the use of different record types to trace families backward in time from Illinois through Indiana, Ohio, New York, New Jersey, and Connecticut. Key online sources include newspapers, historical books, property records, marriage records, military records, and city directories. But if you’re not able to join the webinar on the 19th, or if you’ve missed one of the stellar offerings in this webinar series and want to catch up, remember: there are recordings available of the BCG webinar series. Some are free; some carry a small cost to help BCG recoup the cost of providing the webinars. All are worth your time. For more information on past offerings in BCG’s webinar series, please visit http://bcgcertification.org/blog/bcg-webinars. My registration says April 19 for this webinar. If the date has changed, I did not receive an email informing me of that. Sorry, Suzanne! I wasn’t finished editing the post when I accidentally hit the publish button! It is the 19th, and the post has been fixed! !